On her way to the first stop on their adventure, she encounters Szarok, the Vanguard of the Uroch. Szarok offers to travel with them and Tegan accepts, knowing there is safety in traveling with him. When Tegan is offered a job as a ‘long-haul ship’s doctor’ Millie, James and Szarok all sign onto the ship as well. Each has a different reason for traveling aboard the ship, but none is more important than Szarok’s reason. He is on a mission to save his people and despite the strange feelings he experiences whenever in Tegan’s presence, he is determined to fulfill his mission. Tegan’s affection for the strange but somehow beautiful Uroch grows over time and she defends him from the blatant prejudices of other humans. As their time together lengthens, it is Tegan who, through stormy seas and a variety of strange, new lands, will become stronger than she ever knew possible. The very thinly veiled moral of this story is that prejudice is NOT OK. This may seem like a very basic idea to many of us, but unfortunately, there are still many people who have yet to recognize this very basic truth. The previous three books in the Razorland saga followed the adventures (and romance) of Deuce and Fade. Tegan was very much part of the story, but she was never the sole focus. In VANGUARD, Tegan steps out of the shadows and takes center stage. Although this is the fourth book in the series, it also works as a stand-alone novel. Those who have read the first three books in the Razorland saga will be able to connect with the history of the post-apocalyptic world they live in as we as what led Tegan to this point in her life. Author Ann Aguire has included enough detail about the past that new readers will not find their enjoyment diminished in any way. 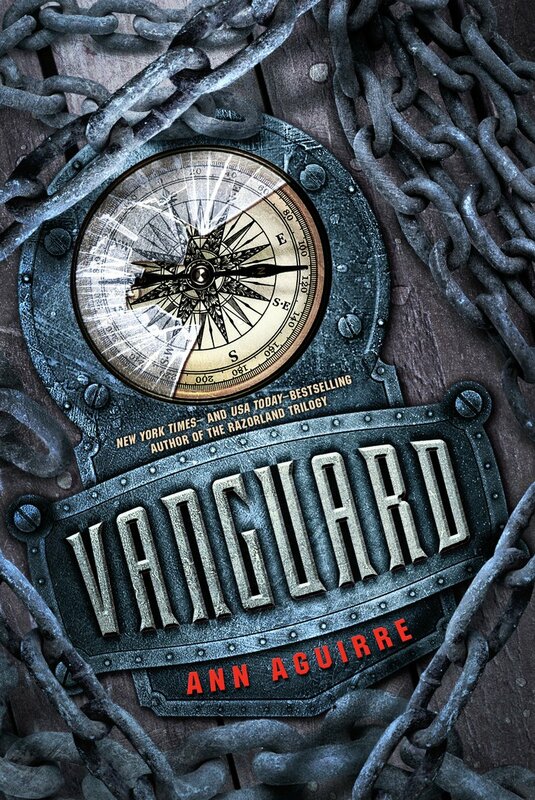 In fact, I believe new readers will be so intrigued by VANGUARD they will want to run out and buy the rest of the Razorland saga immediately. The story begins once Tegan’s Doctor/Mentor/Father-Figure dies and she decides to head out into the world. Tegan’s skill as a healer affords her the ability to provide for herself wherever she goes. When she meets up with Szarok at the beginning of her journey. Szarok offers to travel with her and although the peace between his “people” and the regular humans is tenuous, his offer affords Tegan a measure of security that she knew she would be foolish to refuse. Tegan and Szarok start off their journey as acquaintances who both find each other visually unappealing and dislike each other’s scents and eating habits. They do recognize certain similarities, but their historical and cultural differences and the clear division between their “tribes” are not easily put aside. When the two end up stranded alone together they learn more about each other and their differences cease to be an issue. This is realistic. Once you spend time with someone, regardless of their race or faith you realize that surface differences no longer matter. This is a lesson that is important. People need to understand that skin color, religion, and other differences are not the entirety of a person – they are just the wrapper. It is what is inside that matters. This situation reminds me of racial differences and smacks of ingrained discrimination. Readers should be able to relate Tegan and Szarok’s tale to instances of interracial or interfaith relationships. This book is an extremely easy read and its length makes it perfect for a weekend at the cottage, the beach, at a campground or for a lazy weekend at home. Ann Aguirre uses her considerable writing talent to pen a romance between unlikely characters. Readers can view this book as just a wonderful, light-hearted romance, or they can look a little deeper. If readers choose to look deeper, they will realize this book as one that combats racism. Choosing two different races as her main characters, Ann Aguirre demonstrates a truth that many people have yet to embrace; the fact that just because a person looks different from you on the outside does NOT mean they are different on the inside. The only reason this book did not receive a 5th Star was that in some ways, the plot was predictable. However, this did not in any way diminish my enjoyment in reading this tale. Author Photograph and description obtained from her website.